It's been a minute since I've done a Get the Look post, and I'm happy to report that spring is in full swing—on my Outfits for Ageless Style Pinterest board at least—because this week's most-repinned look is perfect for transitional weather. (And there's no winter coat in sight!) I have a feeling the headless lady in this photo is Sincerely Jules, one of my favorite bloggers, so let's channel her for this casual but classic look. This outfit is simple but relies on a few classics-with-a-twist. First, there's the chambray shirt, updated with a slouchy fit. 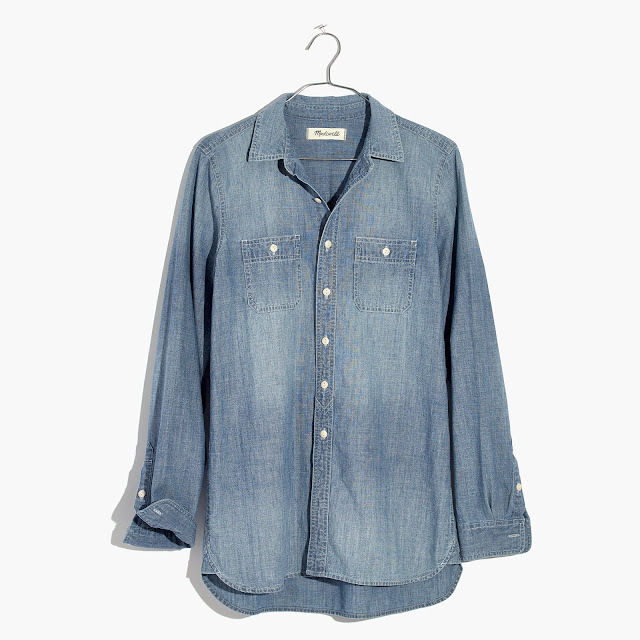 As far as chambray shirts go, you can't beat this Madewell ex-boyfriend shirt, even though it's just slightly different than what she's wearing (it has chest pockets, but minor detail). I have one and wear it constantly. The pants are the other key piece here. She's wearing a refined jogger pant with a sheen; they might even be leather, but that's a style that's very specific and, I fear, not flattering on a lot of body types. 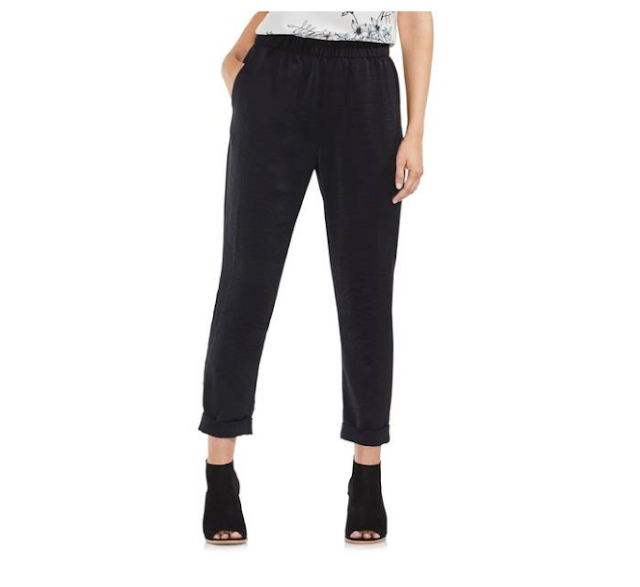 I chose the more forgiving Vince Camuto satin jogger pant—the hammered texture has a bit of shine to it, but the cut is a little more fluid. For an edgier look, I recommend checking out these David Lerner glossy joggers. I have a feeling the slip-on platform sneaker she's wearing is a Vince slip-on sneaker, but this Halogen Baylee sneaker is a good alternative at less than half the price. Sadly, you can barely see her bag, but it looks like it's black with a shoulder strap and some sort of tie detail. This Lodis Los Angeles bag is cute and a great price, but it's rather mini, so if you need something more substantial, this A.P.C. Claire bag is absolutely gorgeous. Finally, the sun is out, so a good pair of sunnies are in order. 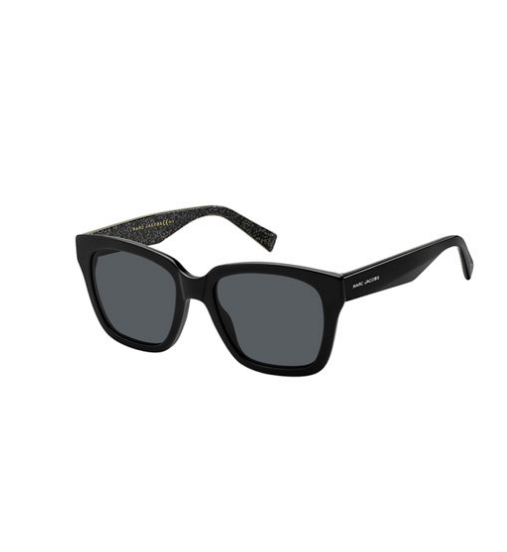 If you're in the market for a new pair, these Marc Jacobs sunglasses are classic and priced well—and they have a fun hit of glitter on the inner temples. 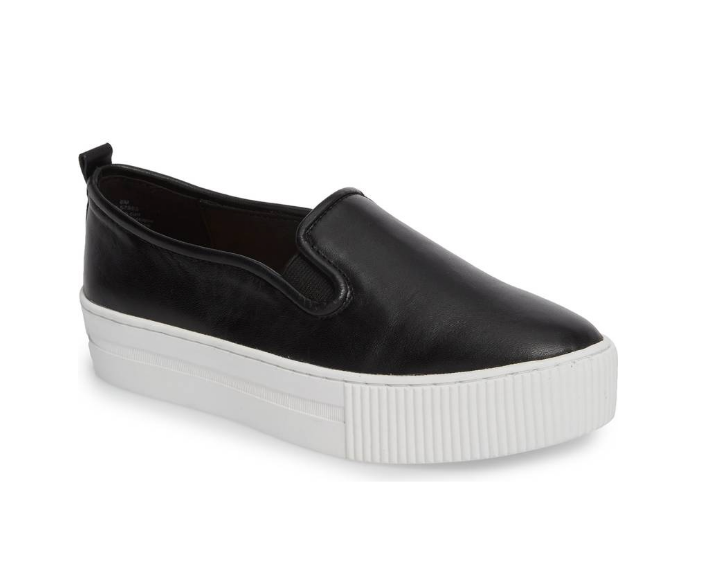 Sincerely Jules always nails the casual cool! Love your picks to recreate this look! 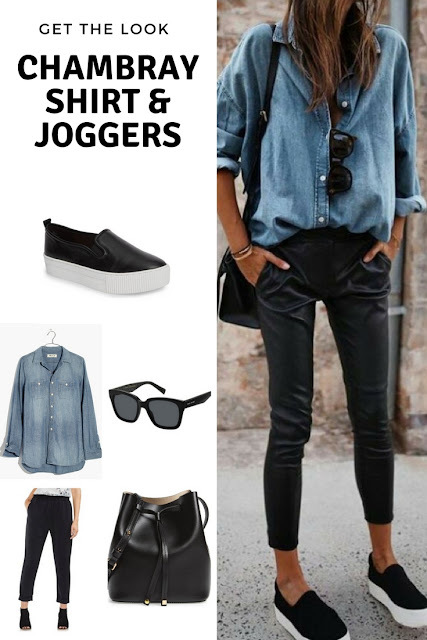 I just pinned this, because I have a pair of black joggers and I've never tried pairing them with a chambray top! Like, how could I have not thought of this? Such a cute idea! May try it tomorrow! Chambray is always a good idea. Super cute! Love this look, Cheryl. I need a new denim shirt this year :) Thanks for sharing at The Easter Welcome To The Weekend Blog Hop. I definitely need to get a chambray top for this spring and summer!